Today’s featured residence is testament to the idea that luxury comes in all price ranges and is relative to your lifestyle. 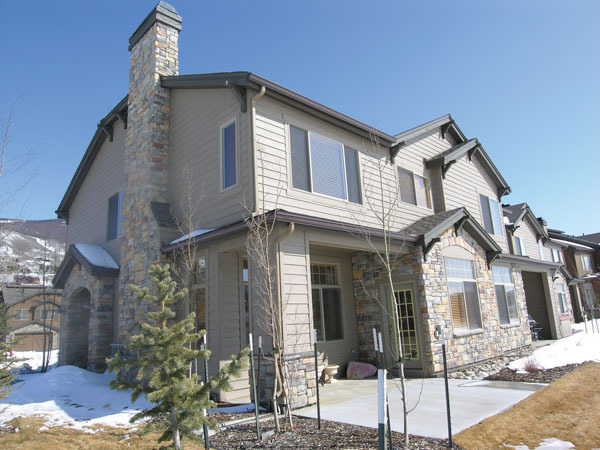 The four bedroom, two and a half bath townhome in The Ponds at 137 Allegra Lane is offered at $599,999 and offers a stellar location central to all of Summit County, as well as views and plenty of sun. The home is located on one end of the complex, surrounded by open space, which feels much more like a single family home. A path winds around to the private entrance. A small hallway and a coat closet greet you in the entry, with a laundry area to the left, as well as the door to the two-car garage. To the right, the main floor reveals the great room, which is centered by a raised hearth rock fireplace with lovely details. Big windows bring in the southwestern sun and fabulous views of Buffalo and Red Mountain. Wood flooring in a light natural tone winds into the adjoining dining room. Here, glass doors open onto a sunny patio with the same spectacular view of the mountains and the adjoining open Space. This is a great vantage point to see a small pond and a municipal building just a short walk away, where you can ice skate in the winter and paddle boat in the summer. Also on the main level, the open kitchen features granite countertops and natural wood cabinetry. Appliances are GE Profile all in stainless and include a range with double oven, microwave, refrigerator and dishwasher. The split height of the counter allows additional seating. On this level is a powder room which adds convenience. Stairs up lead to the bedrooms. One is presently used as a den and workout room. The nearby jack and jill bath features double sinks. The bedroom on the other side is spacious enough for two beds. The third bedroom has another large window with lots of natural light. To the other side of the hallway, the master suite has two closets, one a huge walk in with access to storage above. The ensuite bath boasts double sinks, a separate shower, and an oval tub. Warm neutrals create a backdrop for any decor. Throughout the home, the design is done with a European flair, reminiscent of country French or Tuscan flavor. The home lives larger than its 1914 square feet, with extra windows because of its end placement and great light with no neighboring homes around it. Just across the main road is The Raven Golf Course, with all the amenities including a restaurant. Just a few miles in the opposite direction, the convenience of I-70, the Factory Outlet stores, and other dining and shopping options are just a few minutes away. The Blue River runs behind the Ponds complex, allowing a bucolic setting and nearby Blue Medal fishing. This lovely home is the perfect spot to gather for your mountain adventures in every season. (970) 453-0765, on Twitter at @skismith or by visiting http://www.bonniesmith.com.